Ostwal P*, Shende D**, Dhokia T ***, Chauhan AR****. Exaggerated placental site (EPS) reaction is a non neoplastic lesion characterized by invasion of extravillous intermediate trophoblast into the myometrium and walls of blood vessels of the normal placental bed. It is very commonly seen following spontaneous or elective abortions and may also present as an etiology of 3rd stage post partum hemorrhage. We present a case of exaggerated placental tissue site reaction that caused a diagnostic dilemma as it simulated uterine sarcoma. Exaggerated placental tissue site reaction (EPS) is an exuberant pathologic process in which intermediate trophoblasts infiltrate the underlying endometrium and myometrium at the normal placental implantation site. These lesions may occur following normal pregnancy, ectopic pregnancy specifically scar and cervical ectopic pregnancies, elective or spontaneous abortion, and molar pregnancy. [1,2] They are seen as a sequelae in 1.6% of first trimester abortions. These lesions are neither inflammatory, nor are they limited to the endometrial zone. Therefore, a different class has been created for such lesions by WHO by the name “Exaggerated Placental Tissue Site Reaction”. EPS is a difficult and confusing differential diagnosis for clinicians, and extensive literature search reveals that it has not been studied in much detail. We discuss a case of EPS which had a confusing presentation. (Medical Termination of Pregnancy) pills which was 3 months prior to her presentation, following which she started bleeding heavily with passage of fleshy clots. The symptoms persisted till date of presentation, with usage of 5 - 6 pads per day. On examination, her general condition was moderate; she was poorly built, anorexic and pale. Systemic and abdominal examinations were unremarkable. On vaginal examination, uterus was 12 weeks’ size and soft; heavy bleeding with passage of clots was noted. She was admitted and investigated. Her UPT (urinary pregnancy test) was negative; β HCG level was 15.68 mIU/ml. Her hemoglobin was 8 gm%. Urgent transabdominal sonography was suggestive of bulky uterus with heteroechoic vascular lesion in fundus and endometrium with likely invasion of the anterior myometrium (features favoring malignant etiology). 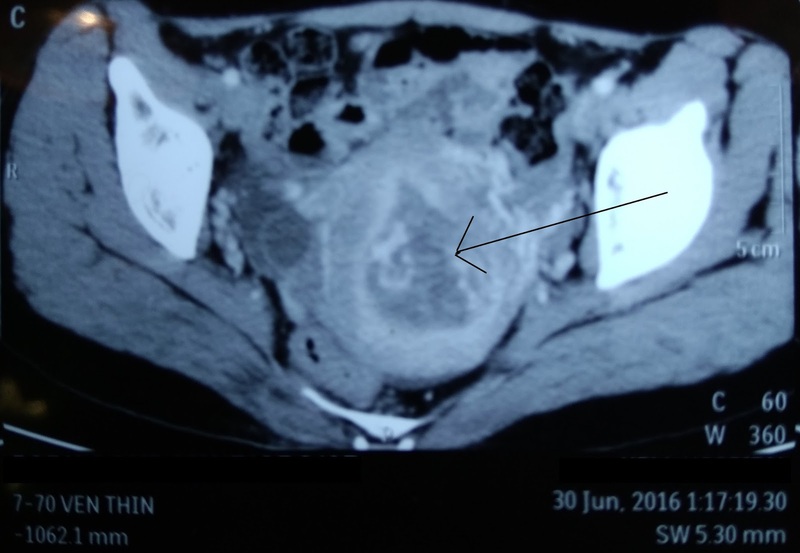 CT scan confirmed increased vascularity in anterior myometrium and endometrium, suggestive of carcinoma uterus, as seen in Figure 1. Tumor markers, serum LDH and TSH were done which were all within normal limits. of uterus suggestive of malignancy. She was stabilized and treatment in the form of intravenous tranexamic acid 500 mg 8 hourly was instituted along with one unit of blood. As she had an episode of uncontrolled bleeding not responding to medical management, uterine curettage was performed and tissue histopathology was suggestive of exaggerated placental tissue site reaction. She was advised endometrial ablation therapy; however she opted for total abdominal hysterectomy. Hysterectomy specimen showed a bulky, adenomyotic uterus. Histopathology examination revealed fragments of myometrium and hemorrhagic material with few degenerated villi and decidual cells. Multinucleated trophoblastic cells were seen scattered in between myometrial fibres. Intermediate trophoblast is called so because it intermediate in differentiation between cytotrophoblast and syncytiotrophoblast. In early gestation, implantation site intermediate trophoblast is significant for the continuation of pregnancy, and to establish feto-maternal circulation, it infiltrates the decidua and invades the myometrium and spiral arteries. Normally, only the upper half of the myometrium and decidua is invaded by these cells during early gestation. This layer regresses progressively over time during later pregnancy. The condition is labeled as EPS when the intermediate trophoblast infiltrates exaggeratedly into the myometrium and fails to regress or involute over time. This was a case of menorrhagia presenting as uterine sarcoma or vascular tumor, which on further evaluation turned out to be incomplete abortion. It is a rare diagnosis of intrauterine pregnancy made only on the basis of presence of extravillous trophoblastic cells in myometrium along with the chorionic villi. These cells are highly degenerative and are also called as wandering cells, migratory cells, megalokaryocytes, diplokaryocytes. In hypoxic conditions, there is increased incidence of syncytial knotting leading to abnormal villous shapes. It is always a dilemma to label a case of EPS in curettage samples based on the histopathological criteria alone, as there are no clear cut guidelines about the degree of myometrial invasion by intermediate trophoblasts in the implantation site at various gestational ages required for it to be labeled as EPS. The standard of care for EPS is endometrial ablation; however our patient opted for hysterectomy as she had completed her family and was unable to ensure follow up. Another important aspect here is distinguishing the lesion from other differentials like uterine sarcoma, other gestational lesions like placental site nodule (PSN), and placental site trophoblastic tumors (PSST). Immuno-histochemical markers used for diagnosis of EPS are cytokeratin (CKAE1/AE3, endomysial antibodies, β-HCG and human placental lactogen, which indicate intermediate trophoblastic origin. [5,6] Recently, CD-146 has been used as a marker for intermediate trophoblasts in the implantation site. It is a cell adhesion molecule which is known to function in the processes of tumor progression, metastasis, implantation, and placentation. EPS is a rare benign trophoblastic lesion, without any risk of persistent gestational trophoblastic disease. However, awareness of this entity is essential as it must be distinguished from other borderline and neoplastic lesions which might require aggressive treatment. More literature and documentation of cases is required to establish the criteria of diagnosing the lesion confidently on the basis of morphology and immuno-histochemistry. Treating obstetricians should be cognizant of this entity and it should be considered in cases which have unconventional presentation. Shih IM, Kurman RJ. The pathology of intermediate trophoblastic tumors and tumor-like lesions. Int J Gynecol Pathol. 2001; 20(1):31-47. Choi JJ, Emmadi R. Incidental placental site nodule in a fallopian tube. Int J Surg Pathol. 2014; 22(1):90-2. Shetty A, Narasimha A, Jyalakshmi VJ. Exaggerated placental site reaction: case report of a rare benign trophoblastic lesion. Int J Reprod Contracept Obstet Gynecol. 2015; 4(5): 1647-1649. Benischke K, Kaufmann P. Trophoblastic neoplasms. Pathology of the human placenta. 4th ed. Germany: Springer 2000; pp.754-767. O'Neill CJ, Cook I, McCluggage WG. Postcesarean delivery uterine diffuse intermediate trophoblastic lesion resembling placental site plaque. Hum Pathol. 2009; 40(9):1358-60. Shih IM. The role of CD146 (Mel-CAM) in biology and pathology. J Pathol 1999; 189:4–11. Luiza JW, Taylor SE, Gao FF, Edwards RP. Placental site trophoblastic tumor: Immunohistochemistry algorithm key to diagnosis and review of literature. Gynecol Oncol Case Rep. 2013;7:13-5.